We are off to Paris. Heading to the City of Love. Luckily missing Valentine’s Day by a few days and unluckily but hopefully not too relevantly, catching the end of half-term. I haven’t been to Paris for such a long time. I used to love it there. My brother lived there on Rue de L’Universite in the 7th. I spent a lot of time there in between university in Tours and over the course of my work at Societe Generale; jetting out once a month or so to see clients and go to nice restaurants. I remember when Hotel Costes first opened, drinking in the bar there, having lunch at the brand new Cafe Marly and the wonderful club sandwiches at the Ritz Hotel, lunch on Sunday at Chez Marianne in the Marais, when the Marais wasn’t half as trendy as it is now! It wasn’t a bad experience of Paris at all. It was a privileged one. So what would be more appropriate than to return after more than 10 years to visit yet another family member living there (my first cousin) and with a new family member myself, in style. Being an ‘older’ mummy (39 but look 30- sorry- it’s the genes and the fact that I’m 5 feet nothing!) myself and Mr Pregnantcitygirl have had the time and the money to lead the high life! First class travel – on the A380 no less – I’m a bit of a plane buff-, trips to the best resorts in the Maldives and many impromptu holidays during two recent gardening leave stints, whether it be returning from one holiday only to book to leave again the next day or island hopping in the Caribbean. We have been very lucky. Travel is a passion of mine so it must only follow that we return to the City of Love with our new love- baby Alexander. 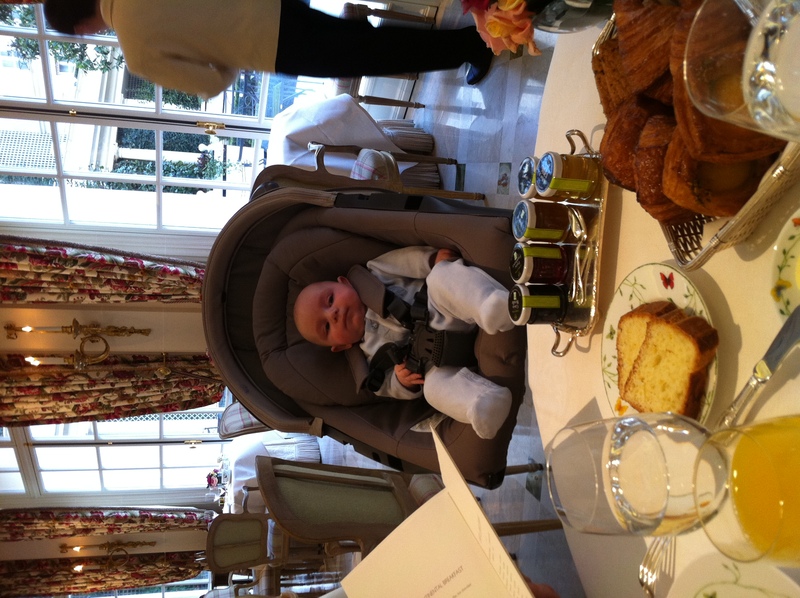 We are testing out Paris in Luxury with a twist; a 3 month old. It’s his first trip abroad. He’s had two out of the three five in one inoculations (sounds like a pet, doesn’t he!) 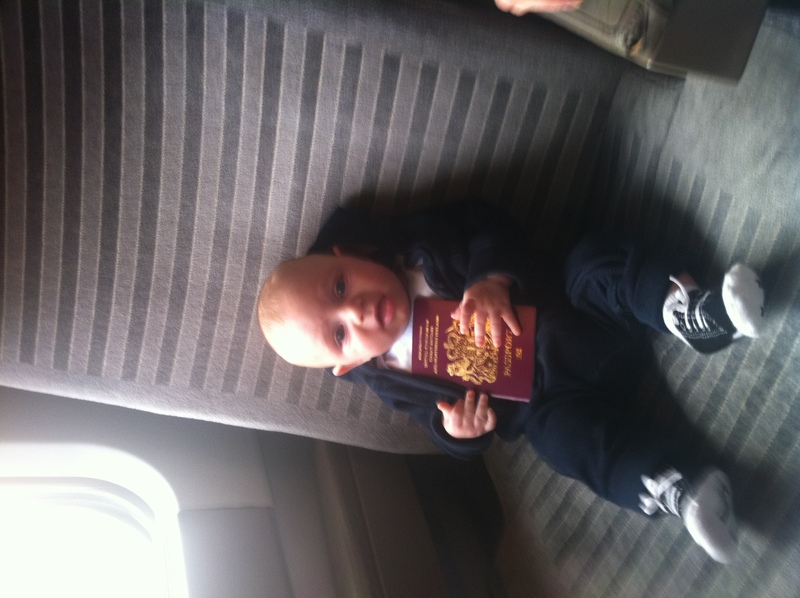 we have his first passport so we are ready to go. Well…… I say we are ready but are we prepared? Most new parents probably take their first trips in the car. It’s much easier to kitchen-sink it that way. Before becoming a parent it was easy, now there is so much to consider. Which pram? The carrycot or the seat attachment (both!!!) , how many nappies? How many baby grows? (All of them). Where will he sleep? – In the cot provided by the hotel (he’s never slept in a cot before, just in his co-sleeping cot, hence we have to take the carrycot to the pram). It’s a minefield. A road (or rail in our case), never travelled before. Do we take a carseat? (No, the hotel is transferring us from and back to the Gare du Nord so I’ll leave that to them). These are just some of the things I have thought of let alone the ones that I haven’t. Luckily, we are going to be well looked after and I expect will want for nothing. We are staying at Le Bristol Hotel. Chosen over the Ritz or the George V ( Four Seasons). I believe that it’s the best hotel in Paris. If you believe Tripadvisor (I use it with caution and always cross-reference) it has glowing reviews almost every time whereas the George V doesn’t have such a flawless review history. I am very picky. A difficult customer. I expect to get what I pay for. So many people settle for less. Why pay for something and be content not to receive it in it’s entirety? Hotels and restaurants are notorious for falling short as it’s very difficult to meet or beat expectations at the top. Hotel Le Bristol, is as French as it gets. Traditional and uber-luxurious. Amongst its numerous awards it’s the first French hotel to be granted the prestigious ‘Palace Hotel’ classification and is part of the Oetker Collection which also includes the famous Hotel du Cap-Eden-Roc. Situated on the Rue du Faubourg St Honore between the Champs Élysées and the Place de la Concorde in the prestigious 8th surrounded by all the designer boutiques (unfortunately my budget won’t be stretching that far) and within easy reach of the Louvre and the Musee D’Orsay- yes we will be taking baby Alexander for his first hit of art culture! So, we chose Eurostar. A bit of a no brainer really. It’s so much easier. The new terminal at St Pancras is ten minutes from our front door and likewise at the other end the Gare du Nord is fifteen minutes from our hotel rather than a possible two hour taxi ride from Charles De Gaulle – believe me, with traffic it can be a nightmare. I remember the timed before Eurostar. The other consideration is the baggage; on Eurostar we are fine, on a plane we would have probably had to buy an extra seat for the amount our excess luggage would have cost us. It’s much easier just to wheel a pram on and off a train. The journey is much faster and for the environmentalists, ( it’s Alexander’s world now!) much greener. There are also loads of options with Eurostar. They offer more than just train tickets as well. With Eurostar Plus (Culture, Gourmet or Shopping) you just show your ticket at certain museums, restaurants and shops to get discounts; some up to 50%. I like a discount! Meanwhile we are traveling Standard Premier class. Extra space, a ‘light meal’ and overall more comfort. I think, if the budget stretches it is worth it with a baby. It’s hard enough with a baby as it is! I’m pleased that we chose Eurostar. Check-in took minutes, even with a pram and two huge suitcases and we were comfortably ensconced in a booth of four seats around a table with the two opposite us happily housing the carry-cot soon after. A light breakfast, some free magazines ( French Grazia and Vogue) and all went swimmingly well. One thing I didn’t think about was the pressure for Alexanders’ ears but I fed him whilst we were under the sea which took the pressure off and he was fine. Easy so far! Well this is part two really because unfortunately I am back on planet earth and home in London. The conclusion is that our first trip abroad with baby Alexander was a huge success and a very easy experience. The Hotel Bristol, one of Paris’ most historic hotels, was fabulous right from the word go.We chose it due to its genuine child friendly offering. They have a children’s program where each child receives a customized welcome pack; in-room toys, snacks, slippers a robe and even childrens toiletries ( I can’t wait to go back with a toddler!) They even organise treasure hunts and go as far as to offer a children’s area in the stunning three storey spa where the little ones can be entertained whilst their parents indulge in a little ‘me’ time. The hotel also offers special meals for kids so that they too can enjoy their own culinary treats – next time Alexander! The car that picked us up at Gare du Nord to whisk us straight to our lunch destination (Le Pre Catalan) came equipped with a baby seat for a small baby- Alexander being only 3 months old. We ate a wonderful lunch as he slept in his cot next to our table. The hotel had recommended this particular restaurant to us as being haute cuisine and child friendly – as per our request – a difficult feat in Paris and in an environment that is more accustomed to a dignified, sometimes snooty silence. The staff at Pre Catalan even took photos of the three if us underneath their wonderfully opulent chandelier. All this whilst our luggage was being delivered to our immaculate junior suite, very thoughtfully containing not just a cot furnished with children’s Hippolyte-themed linen by Porthault but also a changing table, baby bath, a Hippolyte (named after the hotel’s founder Hippolyte Jammet) snuggly rabbit and a matching bib. The hotel had thought of everything even providing extra small towels and boxes of tissues for the baby. The ultimate in luxury to have everything thought about for you and there at your disposal without having to ask. The hotel put us in a junior suite overlooking the courtyard for peace and quiet for the baby. We slept soundly. Almost no need to confirm that it was spacious, beautifully decorated and spotless (you would expect every five star to be spotless but believe me, I have OCD when in comes to cleanliness and there is always a stray hair somewhere or a missed bit of fluff hidden in some crevice). 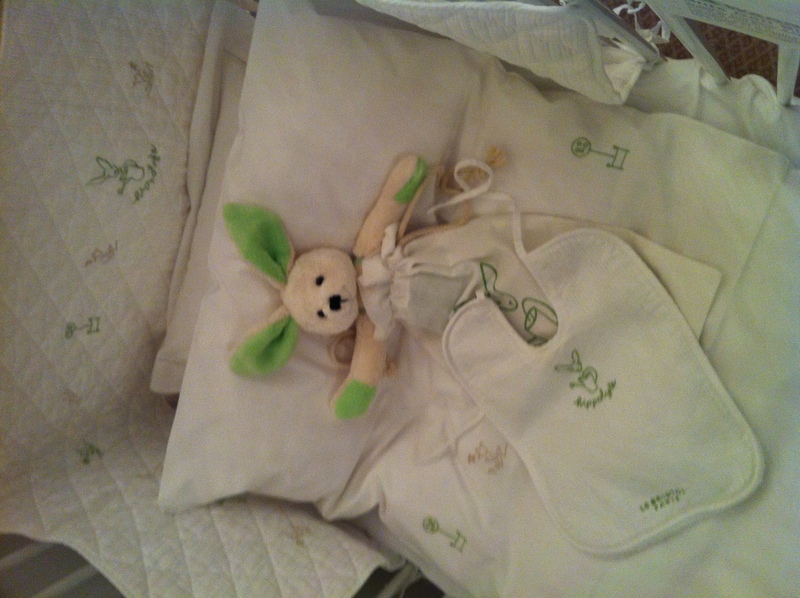 Hippolyte themed cot with all the goodies! The staff were gracious, friendly and more importantly anticipated our every need throughout the stay. The service was faultless (again do not take this lightly as I am a hard task master and I expect perfection when I pay the price for perfection). In the grand but still intimate lobby of the hotel is a flight of steps. Despite there being a lift for wheelchair access, we just had to walk within feet on the stairs and a doorman was there to carry the pram. Every single time. The staff knew Alexander by name and managed to be super professional yet friendly and welcoming; not often the case at very grand five star hotels where staff can be snooty and distant. We even took Alexander in to the bar one night in his pram and we were served graciously and more importantly felt comfortable. Lastly, the hotel helped with restaurant recommendations (we are massive foodies so needed child friendly gastronomic places) anticipating our wishes and booking for us plus pram at out chosen destinations. Breakfast at Epicure, the three-star Michelin restaurant! I really cannot sing their praises highly enough. In all my years of luxury travel , both first class and even private plane (Thailand!) and to the best hotels in the world, this one comes up an easy first. Three words : Service! Service! Service! May I just add that the hotel also has a 3 Michelin starred restaurant (next time!) and that the breakfast was a gastronomic experience, eating in the beautiful room overlooking the garden, where the restaurant resides (can be taken in the bar/ lounge for a more relaxed feel) and that room service too was faultless. Nothing forgotten, nothing arriving cold, no wish unanticipated. A very, very rare find! So in conclusion, if your budget can stretch, go. I can’t recommend first class travel with a baby high enough. You just need to know where to go!